In deze mail staat een link waarop het negenendertigste DKARS-Magazine is te downloaden. This mail contains a link which the 39th- DKARS-Magazine is available for download. Heard a spokesman of the Air Crash investigation team. I walked there it was dark. It is very common these days. Someone wins a big prize and also a new car at the door. To the musically inclined, I explain Morse as a dit being an 1/8 note, a dah is a dotted quarter note. Spaces are rests 1/8 within letters, numbers, punctuation and prowords; 3/8 between letters within words, 7/8 between words. Like any instrument, developing a feel for it takes practice. Though you may learn to read it by responding on a keyboard--the default means of learning nowadays--learning to send it just might take a straight key or some equivalent. This site (made available by K6DBG) offers the CNN Breaking News twitter feed in a variety of speed groups (e.g. 15 thru 7 WPM, or 25 thru 13 WPM) -- something there for everyone. I like the way it changes, after several minutes, to the next lower speed in the group, meaning it gets generally easier as you listen, then eventually starts over at the highest speed in the group. A couple of alternative practice streams are also available. Possible downside: the news feeds include punctuation marks that we seldom use on-air. recently and thought I'd share a little here, knowing we have both qrp and home brew enthusiasts. The kit, named Bayou Jumper, is from Four States QRP Group and inspired by the famous WWII Paraset. It's fun to build, slightly challenging to use, and super enjoyable having qsos on it. Just thought I'd give it a mention in case it appeals to others who haven't yet heard of it. If you see me on the sked page, please hazard a try at a qso with me. The receiver is drifty so might take me time to find you. I just finished building a Bayou Jumper! Yea the receiver drifts - I found that cutting back on the regen helps. I know a man whose Cootie divorced him when he found his owner was hooking up with others using the SignalLink. I can understand, what we need is a digital mode that we can use to send Morse audio with keyed of course by our sweet cootie keys. I just wired Morse KOB to listen to land line Morse and then I went and found Morse com - there's a specific version that you can use to install on Linux, it works fine. Then I put Morse KOB on Linux (it runs on WINE) and it also is working fine. Now for better radio conditions so my poor antenna works better. In the USA even the vice president of RCA who should have known better because he was head of the Morse telegraphy circuits called a bug a "sideswiper". A bug is swiped side-to-side and is a horizontal key, unlike a straight key that goes vertically up and down. But a bug is a semiautomatic key and a sideswiper has no automation at all. Perhaps in Russia they didn't care very much for semi-automatic keys en rather depended on the use of cooties. Hence the name ' russian bug '. ( just a thought ). Last week i worked a german old timer and when i mentionned my key was a sideswiper, he came back on it and said that in the sixties they called a cootie " a russian bug ". Did someone amongst you ever come across this one ? I found a beat up old Vibroplex in a 2nd hand store and bought it for cheap. Under the "Vibroplex" mfrs plate is a second, brass plate measuring 1 1/4 inch wide by about half an inch high, lettered " D. A. S. Inc. with the number A - 556 " below that. Considering all the brokerage houses, pipelines, and outfits other than railroads who once used Morse, I have NO idea who "DAS Inc" might be. It stands for "David A. Sprau." there seems to be several companies with the name D.A.S. Inc. out there and by reading what they seem to do I could believe that at one time they may have marketed bugs made by Vibroplex but from what I can tell none of them (and they may all be related in some way) have been around long enough to have made this a profitable line to carry in quantity. A few years ago the RR Museum of PA had someone give a talk on that subject. I'm sure the author would have to be contacted for permission to use the material. I also did a quick search of the museum's archives, but didn't find anything right away. I knew a silent key from Biglerville, PA whose mother was a telegrapher for American District Telegraph (yes, the origins of today's ADT). He had some telegraph stuff, but unfortunately had lost his mother's equipment in some flooding. I've got a 1912 era bug from him that I need to restore one of these days. 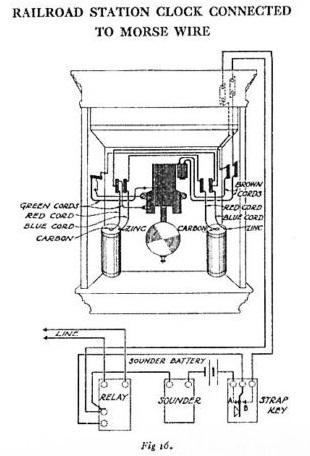 History of the Regulation of Currents on Morse Circuits ? What year was the crossbuck formerly introduced? 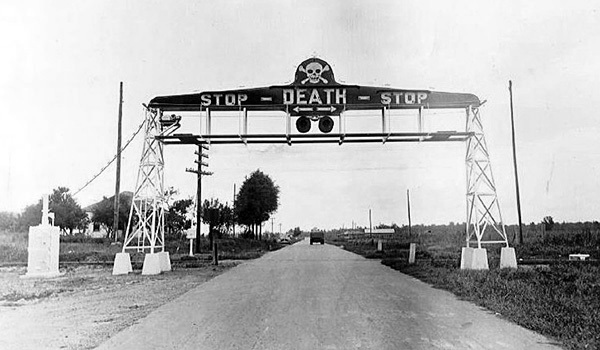 What would have been common at grade crossings prior to this? 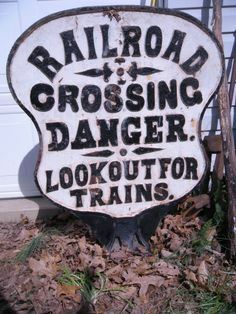 but designs for signs notifying road passengers of a railroad grade crossing and that they should in some way ascertain whether it was safe to cross the tracks before blindly just crossing them goes back to at least the mid to late 18th century. I suspect that like most such things the necessity for their development was, as they say, "written in blood" as too many folks were getting killed at them. It was popular at busy crossings to have a human watchman flag approaching road traffic when a train was about to cross. 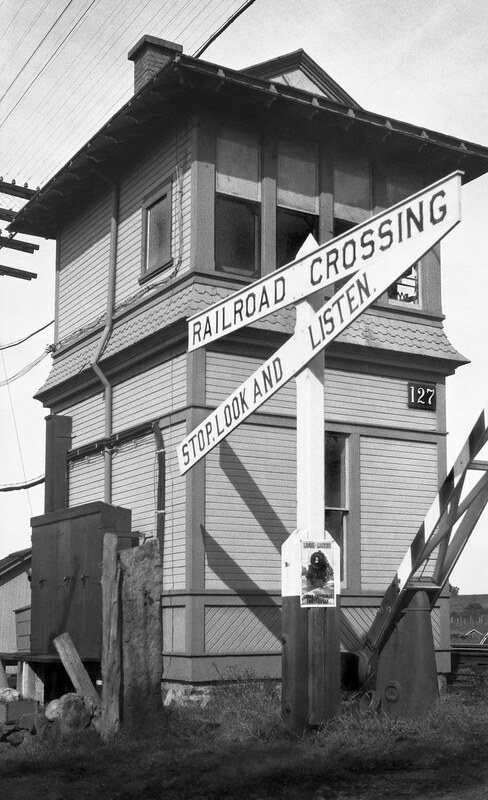 Sometimes crossing gates were provided, manually operated by the watchman. 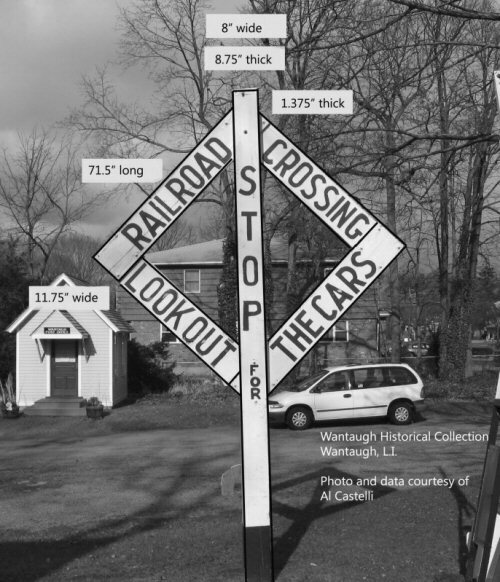 But many alternative grade crossing signs have been used through history. Here's one I've never seen. Our local railroad museum has a preserved one of a design of which I haven't been able to find an on-line photo, a horizontal bar with a half circle arching from end to end above it. Use of battery eliminator/charger to power xcvrs? Have any of you QRP'ers who operate from outside locations ever used a 12V 15000mAh Multi-Function Car Jump Starter Battery Charger as a power source transceivers? If yes, how long does it last and would you recommend? I tend to focus on batteries I can put in a small backpack, so let me address your second question: How long would it last? I invite you to try this handy online calculator posted on the 4 States QRP Club website. If you have a battery of known capacity, this will estimate op time based on mode and transceiver current demands. Or you can ask another question of it: These are my station's demands; what battery capacity to I need to operate x hours? I've not paid attention to this topic, but just reminded myself of a portable power solution I recently discovered which may be an answer to many in this thread. Someone pointed me to a company on line called bioennopower.com who sells Lithium Ion batteries and chargers. I purchased their LifePo4 12.8V 9AH model and accessory charger for my KX3 when on trips. The battery measures 3 x 3 x 4.3 " and weighs only 2.3 pounds. As a backup source I also got their 3AH battery of same chemistry but much smaller and lighter in weight. (As a side note, I know that with the latest firmware, a KX3 is capable of 15 watts output when using a power source of at least 12.8V. This LifePo4 technology easily satisfies that requirement.). At that vendor's web site can be found a broad range of batteries in this technology. Hope this is not a departure from where this thread was headed. Maybe this information will be helpful to some. Have you ever thought about participating in CW traffic nets but found the pace intimidating? Have the nuances of the radiogram format been somewhat of a mystery to you? CW nets are a fantastic way to improve one's CW skills. They offer unique and variable content, which will build your proficiency faster than contesting or predictable, "cookie-cutter" QSOs. Radio Relay International has established a mentoring program designed to assist new operators as they become familiar with net procedures. This program is open to any CW operator and may be of interest to SKCC members. Those registering as students will be paired with an experienced operator, who will work with them to answer questions and practice on-air procedures. combined with one-on-one instruction, the student will be given the background needed to participate in nets in a comfortable and supportive manner. Simply fill out the form and submit it to the RRI Training Manager and we will pair you up with an appropriate mentor. Radio Relay International is a 501(c)(3) non profit public benefit corporation dedicated to the development and enhancement of the national messaging layer. The story behind it's creation extends over multiple decades and might take a few hours over a couple of beers to fully explain. In a broad sense, RRI was created in response to decades of neglect of the former NTS program by ARRL leadership, particularly at the national level. * NTS topics were rarely discussed in QST magazine or within the context of the public service column. * NTS was zero-funded by the ARRL Board of Directors well over a decade ago, yet funding continues for preferred operating interests such as contest administration and the like. * The STM position was affected by the zero-funding and in some sections it was eliminated. * NTS was largely excluded from several public service communications advisory committees over the past several decades. Without a meaningful voice, NTS national leadership could neither defend itself nor contribute meaningful proposals for modernization or improvement. In late 2015, the Federal Emergency Management Agency approached NTS national leadership with a request. The Administrator (Fugate) asked that NTS assets be tested as part of a large-scale Federal Exercise ("Cascadia Rising"), which took place in mid 2016. An exercise was designed to test NTS, which involved the transmission of message traffic in five letter cipher groups from locations in Alaska, Idaho, Northern California, Oregon and Washington State to the National Response Coordinating Center in Washington, D.C. The results were highly successful. NTS CW circuits scored a 99.998 percent accuracy rate against the five letter cipher group messages. appeared in the data stream in D.C. The digital network scored a 99.997 percent accuracy rate as well. The defense contractor was so impressed with the exercise design and evaluation documents that they asked to use them as an example for other agencies. The result: The ARRL Board of Directors decapitated the entire national leadership of the NTS. The Eastern Area Chair was not just fired, but his reputation was attacked in the form of a scurrilous press release. Simply put, it was sort of the straw that broke the camels back for many in the traffic community. Just as SKCC, CWops and FISTS advocate for CW interests, and contest clubs advocate for their interest, the leadership of the former NTS decided it was time to form their own organization. No longer shackled by negative politics and infighting, we have discovered a pent-up interest in traffic networks. Our Digital Traffic Network now extends into Europe. We have affiliated nets in Oceania and Asia. We have confronted long-standing problems such as "spam traffic" and we are working with other organizations to develop meaningful EMCOMM exercises, training methods and related programs. The traffic community is no longer shackled by ugly politics, ego-fueled divisiveness and a lack of funding. Suffice to say, we try not to look back. Our goal is to be positive, forward-looking and proactive. "NTS" still exists at the state/section level in many locations. However, for all practical purposes, NTS above that level really doesn't exist in any meaningful, organized way. Just as CW operators have had to create their own organizations, traffic men and women have done the same and we're much better off for it. By the way...this is not intended as an "anti-ARRL rant." There's much to be said for a national association. However, after thirty to forty years of neglect and then outright hostility, the time had simply come to say "goodbye." We now have our own organization. I just looked at the Rag Chew, SKCC's quarterly newsletter, and was VERY impressed with the care and professionalism, each issue PACKED with really interesting ham stuff. Each issue around 39 pages. Easy to download as well. Under Member Services, click on Newsletter and it gets you to the main page with links to new and recent issues. I had a thought last night on making realistic if perhaps frivolous use of a jack box. But it would provide a live demonstration of the wiring. Set up three line relays or sounders, a resonator sounder, key, etc., all wired into the jack box per the diagrams of recent discussion. Then run three Morse boxes or KOB Loop Interfaces from three separate computer output ports, with their outputs into this hookup. The computer should be equipped with three available serial and/or USB ports. It can all be run with one computer. USB hubs are available that will multiply one USB port into several. A powered hub is a recommended option. 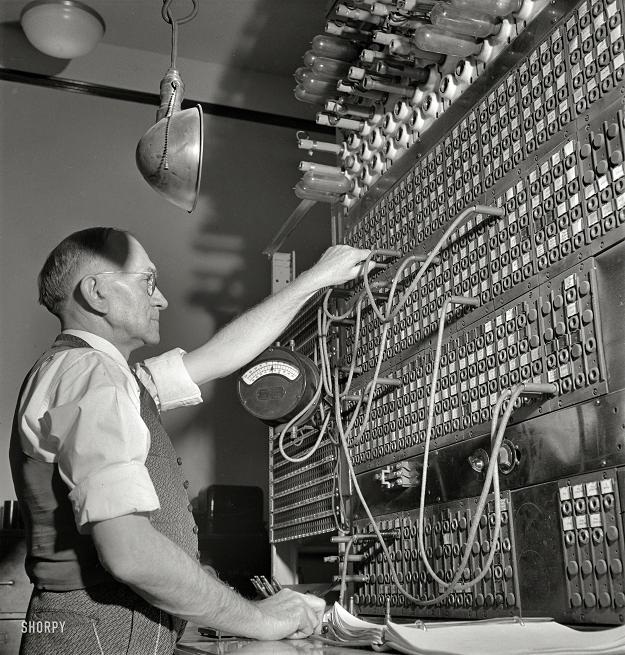 Start the MorseKOB program three times and connect to three different Morse wires or three code text files, or a combination. I just started up the KOB program three times together - one was driving a MorseBox, one running another file into the computer speakers and a third putting a different file as CW tone into the speakers. The jack box can now be used to select which "wire" to run into the resonator sounder. It would be an interesting addition to a serious museum demonstration. Last summer, I had all the instruments in the SB office running at once. Two were the usually running local wires from an MP3 file feeding the original power supply/interface at SB. The other 3 were running feeds from the KOB server with multiple instances of MorseKOB open on my laptop. I did not have any of the wires cut in to the "waking" set at the time, but you can catch a glimpse of the jack box on the table about 8 seconds into the video. You can also just catch the bottom of a monitor we sat outside the office to show visitors some of the incoming Morse. We regularly cut different wires into the local set as a demo or just to get a little more volume when visitor traffic is light. The jack box has 4 wires connected to it and one open position that I have not yet traced to see if it is a good jack for future use. Right now, it's a convenient spot to put the plug so we don't lose it when no wires are connected to the local loop. We still have one more open wire position on the office's plug board and many more possible if we use the museum's WiFi system. We'll probably be using the WiFi for much of the future expansion as it's a lot easier than running wire to displays that sometimes move around. A warm welcome to Pat - VK2IOW who just joined this group. Welcome aboard my friend, feel free to post your questions and remarks to the group. Happy swiping and have fun on the air. oui biensûre c'est un Jacques Brel chanson pur sang. Mais j'ai peur mon Français est déplorable. J'aime la music du chansonier et d'accord, le Acordionist est magnifique, donc je ne comprends pas complètement le texte. (ou est-ce l'inverse..? Français premier et Neerlandais deuxieme..). Merci pour repondre chers Med et Yann. I am not sure why, but as soon as I had read your report words, i immediatly heard Jacques Brel singing "Vesoul". Jacque said words with the same style, an action and its opposite. For our friends who french is not the mother tongue,and as durk said,it's difficult to translate. "Chauffe Marcel" is what J.B said to his accordionist during a public performance, and it stayed etched in collective memory. In France the accordéon is called "poorman's piano" or "straps piano". The accordion was present in all popular songs until the 60s, where the arrival of rock and pop music has a little old-fashioned it. But It's still used in popular ball. The latest Space Weather from Tamitha Skov.